The Mountain Goats' John Darnielle has written songs about speed-freaks, drug-dealing high school running backs, short-time jail inmates, big rabbits, debt collectors, garden-seed salesmen, bootleggers, alcoholics, and attic-dwellers. In the whole lot, the only honest man Darnielle ever bothered writing about was himself. We Shall All Be Healed, The Sunset Tree, and Get Lonely-- his last three albums-- were the autobiographical invocations he'd staved off for over a decade and some 400 songs. Since 2004, he's been his own only subject, after 12 years of avoiding a biography full of sharp objects. "As you all know," Darnielle used to say from stage, "I don't write songs about myself." On Heretic Pride, his newest, the "I" is once again someone else: hopeless urchins, spies from China, a girl in a Marduk t-shirt, a young father, a kid in a Marcus Allen jersey, H.P. Lovecraft in Brooklyn, a reggae singer with a bullet hole in his chest. The antic, hammering thrum of the Mountain Goats' tape-grind era-- before the finer arrangements, the ornamentation, the orchestration of the band's first four 4AD releases-- returns. As before, John Vanderslice and Scott Solter produce. Old usual suspects Peter Hughes, Franklin Bruno, and the Bright Mountain Choir are re-enlisted. St. Vincent's Annie Clark, Erik Friedlander, and Superchunk's Jon Wurster are sworn in. Darnielle wrote songs in Fairbanks, Seattle, San Franscisco, and Durham; their subjects stray as far as the Xinjiang Province, Spanish Town, East Berlin. Darnielle's characters are back where they know best. They join cults ("New Zion"), huddle together in cars ("So Desperate") or gather in smoke-filled rooms ("In the Craters of the Moon"). Many do not survive. "Spoiler Alert!" reads the characteristically bombastic liner note to "Heretic Pride": "The main character here will not live long after he gets done lauding his imminent demise." What a difference two years makes. Get Lonely (2006) was a agonizingly introspective dissection of a dissolving relationship, the logical finale to Darnielle's trilogy of self-revelation, the final unburdening. The Mountain Goats-- champions of the low-fi, singer-songwriter-subverters-- had become scrupulously hi-fi, confessional. Gone was the guitar that played its own drums, gone was the tape-hiss, gone were the doctrinaire fans. Only you and Darnielle remained. "When the villagers come to my door," he sang on Get Lonely's "If You See Light", "I will hide underneath the table in the dining room, knees drawn up to my chest." On Heretic Pride, the villagers return to find their victim no longer afraid. "They come and pull me from my house, and they drag my body through the streets" declares Darnielle on "Heretic Pride": "I will feel so proud when the reckoning arrives." Of all the musicians that have come and gone in the 4AD era, Superchunk's Jon Wurster is-- Peter Hughes aside-- the first to hear, and replicate, the precise, surging, and teeth-chattering headlong rhythm that is Darnielle's stock-in-trade. Behind Wurster's "high-spirits-on-fire" (Darnielle's phrase) four-four, "Heretic Pride" is the most immediate thing the Mountain Goats have done since "The Best Ever Death Metal Band in Denton". Elsewhere, "Sax Rohmer #1", "In the Craters of the Moon", and "Lovecraft in Brooklyn" are seething throwbacks-- taut, propulsive, paranoid, furious. "Lovecraft" imagines the writer come to Red Hook, xenophobic, terrified, filled with hate, switchblade in hand. "Someday, something's coming from way out beyond the stars," snarls Darnielle. "To kill us while we stand here." "San Bernadino": the paranoia relents, the sun rises over the mountains, a young couple with a son on the way checks into a motel; the father runs a bath, scatters rose petals into the water. Composer Erik Friedlander provides the sole instrumentation, a humming cello pluck and a smeared, gorgeous chord progression. Heretic Pride is the first since The Coroner's Gambit to lack a unifying concept, but it has balance: For every furious declaration, there's a moment of uncertainty-- the unresolved lovers and muted chords of "How to Embrace a Swamp Creature", the neutral meeting place the two estranged people pick to reconcile in "So Desperate". 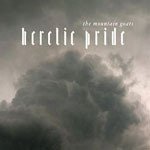 As in most of the post-Tallahassee Mountain Goats material, Darnielle's Heretic Pride writing tends towards themes rather than details, movements rather than moments. But human beings stride through his songs once again; for every broad-stroke metaphor-- "Autoclave" heart-as-surgical-purifier, "Tianchi Lake" swamp-monster-- there's a "Marduk Men's Room Incident" disco-refugee, her head against the sink, trying to cool down. Heretic Pride's title is lifted from an Aura Noir's "Black Deluge Night"-- "Soaring demons now swarm the skies/ In awe and heretic pride," goes the couplet-- but Darnielle's got his own invasion stories. Sunset Tree outtake "The Day the Aliens Came" imagined a smoldering planet, rooftops and sidewalks "melted like plastic," one man still standing: There's Darnielle, wearing Italian shoes and a white tuxedo jacket, a survivor explaining himself for the sake of the rest of us. John Darnielle on his love of metal, his Carolina pride, and his turn in recent years toward creating harrowing, autobiographical music. John Darnielle's latest is a meditation on loss, inspired by the dissolution of a romantic relationship, and in its own way is as dark and brutal as his gut-wrenching 2005 album/memoir The Sunset Tree. British Sea Power Do You Like Rock Music?